Botany members may access our wired network through any of network ports on the wall. 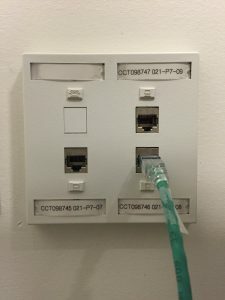 Using a CAT5/5E/6 network cable, simply plug one end into your PC network adapter and the other end into the wall jack. We can provide you with a cable if you do not have one. UBCSECURE – Available to all faculty, staff, and students with a valid CWL. UBCPRIVATE – Available to all faculty and staff with a valid CWL. UBCVISITOR – A public network for light web browsing; intended for guests visiting on the UBC campus. EDUROAM – A collaborative network that provides students, staff and faculty roaming wireless access at partner institutions. Users authenticate using the same credentials as they would at their home institution. On campus, we recommend that you connect to the “ubcsecure” network for an encrypted and secure connection. Remote access to UBC resources is possible through myVPN (Cisco AnyConnect), which is available to all faculty, students, and staff. To set up the myVPN client on your device, please refer to UBC IT’s myVPN documentation.